Spalding teenager Jordan Philpott was a surprise winner of the annual Nigel Kettle Memorial Open at Stamford over the weekend. The 19-year-old topped a strong field that included five of the world’s top 20 players on the World Bowls Tour ranking list, including world number four Greg Harlow, who was beaten on a tie-break by Philpott in the final. Philpott, a former British Under 18 indoor singles winner, lost the opening set 7-4, won the second 5-3 and then produced an inch-perfect shot into a nest of Harlow bowls around the jack on the third and decisive end of the tie-break to claim the £750 first prize. World indoor champion Nicky Brett, who played the host club’s eight-year-old under 12 singles champion Owen Aspinall in the first round, winning 9-0, 11-2, lost in the second on a tie-break to Ely’s Ed Elmore, who he plays with outdoors at Warboys. In the semi-finals, Philpott defeated Paul Roberts (Sleaford) 11-2, 8-4, while Harlow, who defeated Stamford club president Bob Warters 7-3, 7-5 in the opening round, accounted for Norfolk’s Richard Summers 10-1, 7-2. Bowls England junior deputy president Bill Smith, from Leicestershire, was the principal guest at the Huntingdonshire Bowls presentation luncheon at Slepe Hall, St Ives, on Sunday. He proposed a toast to the county during which he congratulated all those players selected for international duty, along with the county’s representatives at the national championships in Leamington. County president Freda Thomas responded and paid tribute to the work of the county’s executive and thanked all those players who had supported the county. She said she was delighted with the progress of the women’s Johns Trophy team last season, and also thanked Bob Morton for all his efforts with the men’s Middleton Cup and under 25 squads. Four-bowl singles: Catherine Popple (Parkway); r/u Sabrina Parnell (Parkway); Two-bowl singles: Michelle Barlow (Parkway); r/u Juliet May (Buckden); U25 singles: Chloe Brett (Warboys); r/u Amy Avory (Warboys); U25 pairs: Amy Avory & Chloe Brett (Warboys) received walkover; Senior pairs: Val Newson & Pat Reynolds (Parkway)l r/u Val Corn & Jenny Casey (Buckden); Senior singles: Sheila Craig (Conservative); r/u Val Corn (Buckden); Pairs: Sarah Newson & Catherine Popple (Parkway); r/u Heather McKillop & Margaret Elstub (Houghton & Wyton); Triples: Emma Thurston, Hannah Overton, Pat Reynolds (Parkway); r/u Jan Elliott, Karen Leader, Sandra Minnett (Sawtry); Fours: Sarah Newson, Julie Masters, Val Newson, Catherine Popple (Parkway); r/u Emma Thurston, Hannah Overton, Michelle Barlow, Pat Reynolds (Parkway); Secretaries singles: Juliet May (Buckden); r/u Margaret Elstub (Houghton & Wyton). 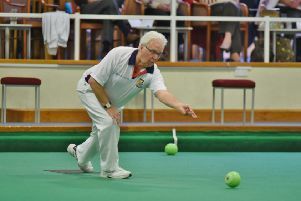 Four-bowl singles: Simon Leader (Warboys); r/u Ed Elmore (Warboys); Two-bowl singles: James Price (Brampton); r/u Ed Elmore (Warboys); U25 singles: Joe Randall (Parkway); r/u Ed Elmore (Warboys); Senior pairs: Tony Scarr & Trevor Collins (Parkway); r/u Stuart Reynolds & Bob Amos (Parkway & Warboys); Senior singles: Nigel Eagle (Parkway); r/u Tony Reed (Whittlesey Manor); Pairs: Ean & Tristan Morton (Parkway); r/u Tom Swannell & Ed Elmore (Warboys); Triples: Harry Ward, Lewis Baker, Nicky Brett (Warboys); r/u Ean Morton, Mike Robertson, Tristan Morton (Parkway); Fours: Stuart Reynolds, James Harford, Simon Law, Stuart Popple (Parkway); r/u Brian Martin, Ean Morton, Mike Robertson, Tristan Morton (Parkway). Shotbowl Champion of Champions: Scott Wilson (Eynesbury); r/u Albert Corn (Buckden); Under 18 singles: Chloe Brett (Warboys); r/u Toby Furzeland (Sawtry). Men’s Stuart & Co Shield: Warboys; r/u Parkway; Women’s Top Club: Parkway; r/u Conservative. Yaxley-based Chloe Brett, daughter of world indoor singles champion Nicky, has been chosen for the Bowls England youth academy which gets together at Leamington at the end of May next year. Her selection for the 16-strong academy follows a recent trial at Leamington.